Saint Thomas is world renowned for its many large intact shipwrecks very popular for wreck diving. Saint Thomas is a lush tropical paradise with white in palm trees fringed beaches, beautiful green-blue-ish waters and fantastic scuba diving. The capital of the US Virgin Islands, Charlotte Amalie, is located on the south side of St Thomas, protected by the offshore islands Water Island and Hassel Island (Part of the Virgin Island Marine Park). You can find guesthouses (backpackers) as well as private villas and luxurious resorts. Charlotte Amalie is the place to be for entertainment, bars, elegant dining and live music. The Cyril Emmanuel King Airport is the only international airport to enter the United States Virgin Islands, so this is where most divers start their adventure. St Thomas is a hilly island which treats you with superb views and vistas such as Drake's Seat (named after the famous Sir Francis Drake) and the sky-ride towards Paradise Point. Other attractions near Charlotte Amalie Harbor are the duty free shopping complex Mountaintop, its world-class yachting, its excellent sport fishing and the pretty bays Lindbergh Bay, Krum Bay and Crown Bay. 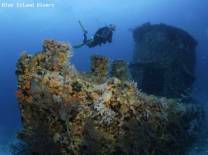 Saba Island and Dry Rocks are located in the west with fantastic ship wreck diving. Several cays and islands on the western tip through Savana Passage provide for some remote scuba diving. The north is quiet but offers brilliant scenery such as Coki Point, Magens Bay and the Brass Islands. On the east side you can find the town Red Hook that serves as the gateway towards the British Virgin Islands across Pillsbury Sound. The St James Marine Reserve includes the islands of St James but also Cowpet Bay, Cas Cay, Bovoni Cay and Compass Point. Its marine park is vivid and diverse. There are plenty of turtle hatching grounds and its underwater scenery ranges from nice canyons to steep walls in hefty currents. Famous however are its many huge transport freighters and other ship wrecks. You can dive the WIT Shoal II, the Cartanza Senora and the WIT Service IV. They are all nicely encrusted in hard and soft corals, most very well located and intact for wreck penetration dives.